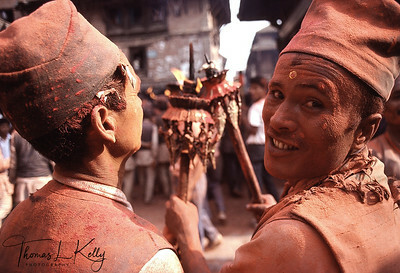 Three miles west of Bhaktapur, at the village of Thimi, the new year is celebrated late into the night with the burning of hundreds of ceremonial oil torches so hot that they drive away the last of winter and bring warm days of sunshine to nourish the crops. 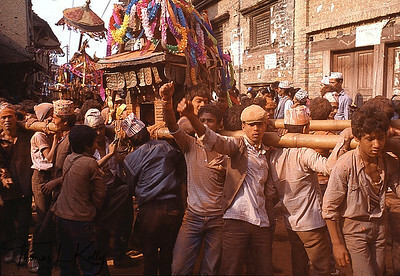 On the second day of the new year, neighbourhood deities are carried through the street in temple-like wooden structures called khats. 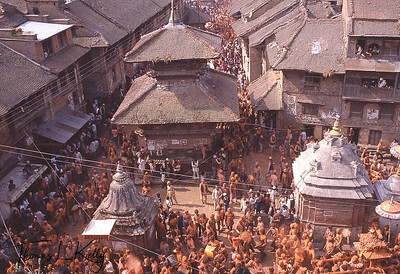 Spectators shower the images and one another with orange powder. 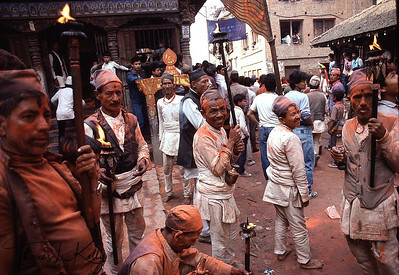 To soak one’s friends and neighbourhood in dye powder is a token of good wishes and respects, just as it is to honor gods and goddesses.